An old friend of mine from the Australian Horror Writers days, Bryce Stevens, has just interviewed me for his charmingly-titled Choking Dog Gazette. It’s my first real standalone interview, so I’m grateful to Bryce for showing the interest. And it’s nice to be getting some press too. It’s a little amusing that with all the interviews and articles on Wolf Creek 2 that are starting to surface no-one has taken the time to speak to the person who, you know, actually wrote it. Maybe that will change, I don’t know, but I’ll have some things to say about the writing process and my intentions and approach in a post soon, so at least I’ll get the author’s POV out there. Steve Proposch, the former editor of the seminal Bloodsongs magazine (which I was also involved with back in the day), has been kind enough to repost the interview as part of the September issue of online art magazine Trouble, so I’ll link to that and post his version of the interview below. Check out the troublemag.com site for other articles of interest every month. It’s a great independent overview of the visual and performing arts scene. Aaron grew up and went to school in the state of Victoria in Australia. After studying Shakespeare, the Romantic Poets and Greek tragedies at university, Aaron convinced his graduate school to let him study contemporary horror; his PhD work examines the impact of late capitalism on the works of Bret Easton Ellis, David Cronenberg, Clive Barker and other exponents of postmodern horror. As well, Aaron has presented academic papers on American Psycho and Crash at the International Conference on the Fantastic in the Arts. Aaron’s first published story, ‘The Third Rail’, appeared in 1998 in the very successful Jack Dann/Janeen Webb mass-market anthology Dreaming Down-Under; published in hardcover and paperback with a subsequent reprint. A number of stories followed, including his take on werewolves, ‘Watchmen’, which was quickly optioned for film after appearing in 2003’s tri-country Gathering the Bones, edited by Jack Dann, Ramsey Campbell and Dennis Etchison. Aaron has for many years now been a major player in the development of the Australian horror scene, having edited The Journal of the Australian Horror Writers and worked with Bloodsongs magazine, and also serving as the regular Australian correspondent for Hellnotes: The Insider’s Guide to the Horror Field. Since the late 1990s, however, Aaron has been actively involved with screenwriting. It is his contribution to this latter field of horror and speculative fiction that we will concentrate on in this article. Currently, Aaron is busy filming the Australian horror/thriller Wolf Creek 2 — of which he is co-writer — in the heat and dust of the South Australian Outback. I was not able to have a face-to-face with him so this is an email interview, with Aaron probably shaking his fist at the cruel sun, while I sit comfortably here, near Sydney, with a cold beer. Bryce Stevens: Let’s begin with your story ‘Watchmen’. Can you tell us how that tale was offered for option to film? Aaron Sterns: I showed that story around to friends before submitting it, as I usually do, and it fell into the hands of Adam Simon (who wrote and directed the trippy Bill Pullman/Bill Paxton Roger Corman-horror Brain Dead, amongst others). It was a pretty raw story for me, being based on a number of progressively Taxi Driver-like years bouncing in nightclubs to pay the bills while studying, and Adam saw some potential in the idea. He commissioned me to adapt it into a screenplay (now called Blood), but it was clear it needed more world-building. The editor of most of my short stories, Jack Dann, encouraged me to expand it into a novel as well, which until that time I’d never been game enough to attempt, and I’ve spent the last few years (when I’ve had time) developing the storyline and mythology. It’s in pretty good shape now, I think, so I’ll see how I go. Hopefully all the work’s been worth it. BS: I have found that it is not always necessary to meet publishers face-to-face to make a story sale. Often word of mouth or previous published stories will garner a writer attention for potential future sales. Do you think it’s different for screenwriters, whereby it’s better to personally meet and greet potential backers or directors/producers? AS: It’s all about the meetings. A good spec script or a produced credit should at least suggest you can complete a coherent screenplay, but there’s still an element of auditioning. It might be pitching your take, listening to their angle, developing an idea together. You can do a lot more remotely in the Internet age, but you still need face-to-face contact. To be a serious screenwriter you probably really need to live in the epicentre of it all: Hollywood, but I’m not quite there yet. Maybe a few films from now. BS: You were credited as Script-Editor on the Australian gruesome creature-feature Rogue (about a monster crocodile stalking a group of tourists in tropical Australia). Can you tell us how you came to be involved with that project? 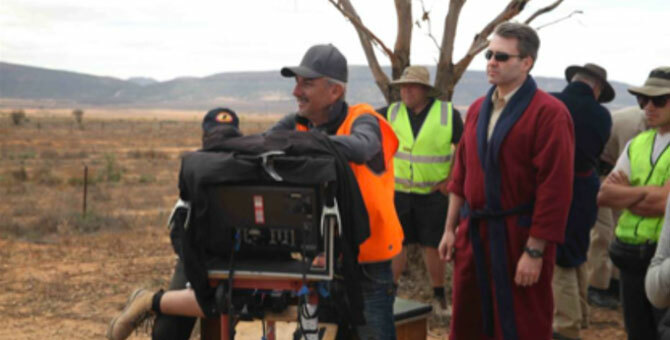 AS: I’ve had a bit of a weird initiation to film, having come from academia and horror fiction and theory, and would never have contemplated screenwriting if I hadn’t met Simon or Greg McLean (director of Wolf Creek and Rogue). I was lucky enough to meet Greg before either of us were published/produced, and I shared an office with him and another friend, Dan Austin, here in Fitzroy. We’d trade scripts and stories back and forth and talk film (him) and horror theory (me) for far too much of the day. We then wrote a few spec scripts together, and once he made Wolf Creek things opened up a bit. He moved on to a script he’d written some years previously that I’d given various notes on — Rogue — while I wrote the sequel to Creek. I was then brought in during the editing of Rogue to give my two cents about the structure and shaping. I like to argue so quite enjoyed that actually. 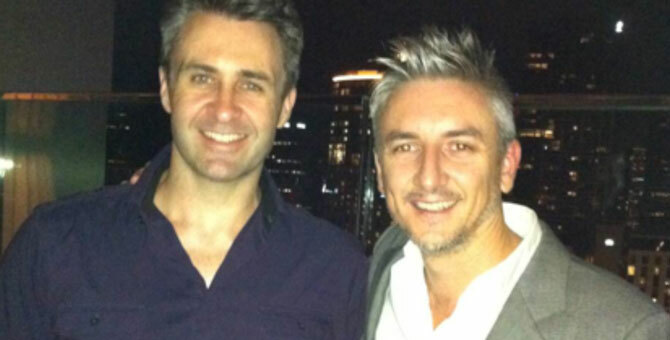 Aaron, left, with Wolf Creek and Rogue director, Greg McLean. BS: Was your successful involvement with that production a catalyst for you to seek more professional work of this kind, or were you approached by other Australian production companies? AS: I did script-edit a number of other screenplays after this, helping out a producer I knew with some scripts at the funding application stage. While breaking down others’ stories helped my own craft, I’ve since tried to minimize how much of that work I take on. There’s only so much time in the day (particularly with a beautiful little daughter-who-must-crawl-everywhere taking up so much of it!) and I’d prefer to be spending it on my own work. BS: You mentioned to me in an email a while back that you had a cameo in Rogue. It must have been fleeting, because I didn’t see you. What character did you play? Oh, and did you get chomped? AS: I didn’t make the final cut, alas. After the nightclubs I spent a number of years doing bit parts and extras work (mainly just to get a look at film sets like Ghost Rider and The Pacific) and have cameoed in each of Greg’s works, appearing in his short film ICQ as a sadomasochist wearing a leather mask and not much else who cuts his hand off, the Nazi General in the trailer for his WW2 zombie graphic novel Dark Axis, one of the evil truckies in the roadhouse in Creek, and recently as … someone, towards the end of Creek 2 (which I can’t disclose until it’s released). There was supposed to be a final shot in Rogue where the croc’s been captured and is strung up by grinning hunters. Greg enlisted a bunch of friends and then had to cut us from the film (as it was better to finish with a shot of Michael Vartan’s Pete). Ah well, at least I got to hold a shotgun for a whole day. On the set of Rogue. BS: One of the Monty Python team once commented on their final movie as a group: “The Meaning of Life was a good movie, but it was one script rewrite away from a great movie.” In regards to your own work, how do you know when enough is enough? AS: Screenplays are rewritten incessantly in the lead-up to financing, during pre-production, and often even during shooting. There’s always some tweaking that can be done, or someone has an opinion that must be incorporated. Film is collaborative, as they say, and you can’t afford to be precious about your words, as annoying as that can be. In fiction you can argue for your prose with an editor and sometimes win. In film you’re often arguing against twenty others, and sometimes they’re even right. Your job is to know which battles are important, and when some suggestion’s going to destroy your idea, and when one will improve it. I’m always focused on the end product, so I don’t care if I have to swallow my pride if it’s for the good of the movie. The flip side of this is that it’s very hard to know when a script’s ready to show, let alone ready for shooting. Everything’s so permeable that it can sometimes be hard to know if enough is ever enough. You can rewrite forever. The most important thing is to nail the central idea and solidify the structure. Sequencing of scenes and dialogue changes and cutesie flourishes are minor compared to securing those massive things. BS: Let’s talk a little about your latest project, Wolf Creek 2. The first movie was an international success, even gaining the attention of Quentin Tarantino, who praised John Jarratt’s role as the sadistic murderer Mick Taylor [Jarratt subsequently appeared in Tarrantino’s film Django – ed]. Can you tell us how you came to be recommended for this gig? AS: Greg and I had already written spec scripts together (including a fast-zombie movie before the Dawn of the Dead remake stole our thunder). I’d talked a lot with him about Douglas E. Winter’s theories of anti-horror and the tendency in modern horror to undermine generic conventions, and a little of this may have found its way into Wolf Creek, as it arose from a more conventional script of his about a serial killer who hijacks a tour bus in the Outback. We started casually spitballing ideas for a while until we happened upon one that seemed big enough for a film. Great, Greg said. Now go write it. BS: Can you tell us the process of collaboration on a film script, as you did with Wolf Creek 2? AS: We spent a lot of time on the treatment — I think it was over thirty pages long in the end — and once we were happy I secluded myself for a few weeks to write the first draft. I’m happy to say that’s still the spine of the story. Greg did his own pass and we’ve basically been passing it back and forth since. There were little changes still being made during rehearsals, and even in the editing room there were things to nip and tuck. Thankfully I’ve been involved during the whole process, which can be a rare thing for screenwriters, who are often discarded once they’ve written the script, like a prom date who’s put out too soon. It’s crazy, because probably no one knows the structure and intention of the film better than the writer/s. BS: When one or the other of the collaborators has what they believe is a great scene and their writing partner is against it, how is a compromise met? AS: It depends who can argue loudest. You have to be open to criticism and weigh up whether the suggestion’s valid. There’s an adage that you must ‘kill your darlings’ during rewriting. A great scene or image or line that doesn’t fit with the whole of the movie has to be cut. It doesn’t matter how good it is. That’s part of the benefit of having another writer on board: that second critical opinion. Later on the producers have their notes, even the investors sometimes have their notes. By this stage the script’s starting to be dragged kicking and screaming out of the writer’s hands, but we can still have some influence here, fighting changes we don’t agree with, or working out how to incorporate good suggestions. It’s tough, but once everyone’s on the same page hopefully the budget’s still in place and everyone else can do some work. BS: Has there been any rewrites during production of Wolf Creek 2? AS: Many. But that first draft has surprisingly stayed very much intact. There’s a new prologue scene at the start, and we now have a different ending, but the core storyline is all there. It’s quite amazing really. BS: Earlier this year you informed me you were on location for the film in the dry summertime outback of South Australia. Can you tell us what it was like being on set, watching the shoot, in such trying weather conditions? And how did you feel when you heard the actors reciting the dialogue you wrote? AS: It was hot, damn hot. But I did spend some of my early years living in Adelaide, so I’m used to the dry heat there. I was only on set a small percentage of the overall shoot, so I got off lightly compared to everyone else. And I was too happy to be there to complain. The first day I was on set was quite surreal, as I turned up mid-morning to the sight of two characters from my dreams hitchhiking nonchalantly down a closed-off highway. I couldn’t stop grinning at how well these two actors (I won’t say who they are yet) fitted my imagination, but then I remembered what I put them through later and felt instant guilt. Glee mixed with guilt, that’s the emotions I remember. I felt the same thing when I saw the first cut. BS: Is the sequel as confronting as Wolf Creek? AS: ‘As confronting’? I hope it’s a whole lot more. We’ve ramped up everything in the sequel. And John’s pulled no punches in his portrayal of Mick. There’s a couple of scenes in particular that I was worried we could have pushed too far, but in the context of the film I think are justified and work brilliantly. The audience will make up their minds, of course, but we’ve put a lot of work into pushing this to the limits. BS: You mentioned you have a cameo in WC2. Can you tell us what to look for, or when to expect you? AS: I’m right at the end. Look for the big angry guy (I could say that about all my roles, really). BS: Do you have any humorous anecdotes about your time on the Rogue or Wolf Creek shoots that you might like to share with us? AS: I did get to play with the actual R2D2 used in the Star Wars films (the ones shot in Sydney) that maker Justin Dix brought to the set of Rogue one day. And I got to have a lightsaber fight with Nash Edgerton, who was Ewan McGregor’s double for Obi Wan Kenobi’s fight scenes. As a former Kendo exponent, it doesn’t get much better than that. 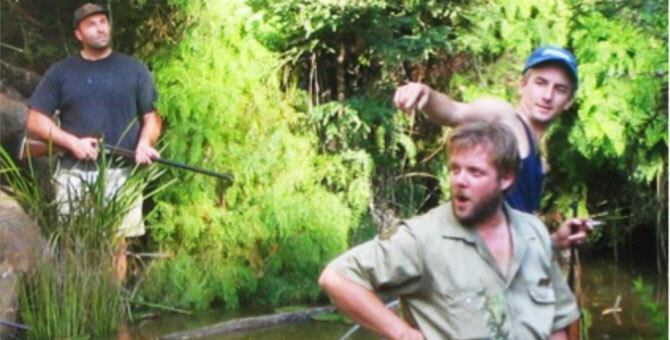 Also amusingly with Rogue, someone leaked a story that a crocodile had been let loose from the set in Warburton, and before we knew it a Channel 7 chopper was buzzing the lake we were filming on. It took a while to convince them the only crocs in the film were animatronic. BS: You’re also writing the first in a series of Wolf Creek novels, is that right? Can you tell us a bit more about the intended series? AS: The films are sequels, extending out from the first movie. But the novels are prequels set in Mick’s early years. I’ve written the first in an intended series of six, Origin, which follows Mick’s fairly horrible childhood and his first job as a seventeen/eighteen-year old on a cattle station where he’s trying to fit into society and failing. These novels will flesh out the Creek universe in a unique way I’m not sure any other Australian horror film has done, or could do. BS: Can you tell us how you approached writing the novel? Did you just go scene by scene, or because it is a novel and not a 90-minute screenplay, did you delve deep into event and characterization? AS: It’s not based on a screenplay, but is a completely new story so it’s not written as a simple expansion or adaptation of a film. I approached it as if it was an Australian Gothic novel, unmindful about criticisms of Creek being a simple slasher film (which it isn’t) or a one-dimensional horror. I felt I could say something about the darkness in the Australian psyche in this novel, capture some of the desolation and harshness of the landscape, and explore the unwinding of Mick’s mind. My intention was that it could stand alone without the film, rather than just being a knock-off attempt to exploit the franchise. Penguin commissioned the series last year, and Greg managed to convince me to write the first (and juiciest, as it’s the origin story) despite a deadline of just four months. I had two weeks to flesh out the two-line idea into an actual story and then conduct a lightning research trip. Firstly I interviewed John Jarratt about his ideas on Mick’s character (as I would have to delve deep into the serial killer’s psyche), then I picked up on some of John’s stories about his own childhood. He mentioned he’d grown up in Aramac, a tiny town in the middle of Queensland, so I booked a flight and visited it, then arranged to stay at a cattle station nearby for the second half of the book. I developed the story as I drove the vast Queensland highways, then jumped straight into the writing upon returning to Melbourne. And somehow I made the deadline. It was such an intense and harrowing experience I’ll have to see if I’m involved with any of the other novels, but if not, there’s a wealth of local horror writers we’re hoping to tap to continue the series. BS: You mentioned to me that prior to writing the novel you were told to ‘go for it’, so you did just that; and then when you handed in the manuscript they asked you to tone down a few places. A. What happened there? And B. You won’t be letting the unused prose go to waste, will you? AS: It’s a common theme with my work. I’m always having to cut out the good stuff. There were a few scenes that were a bit too graphic for Penguin, but the screenwriting experience has prepared me well for knowing when it’s necessary to rewrite for market, so I fought for what I thought should stay, and changed what I thought was indeed gratuitous. I hope we’ve got a happy compromise. People expect Creek to be horrific, but in retrospect there are probably a few things I surprised even myself with. BS: Many writers have their personal favourites. Some like the highly disciplined short form, or verse; some enjoy the leisurely pace of the novel, whilst others may prefer the strict guidelines of a screenplay. I know you like all forms. Do you now have a preference? Also, because they are such differing disciplines, how do you manage to juggle your hats? AS: It’s not easy. My short story writing has fallen by the wayside, because each story requires so much effort for relatively little gain. The more years I’ve worked as a writer the bigger my ideas are getting too, so I’m leaning more towards longer works now. But the way I see it is, you do short stories for the art, novels for depth and to have some control, and screenplays to make an impact. The writing techniques required for each are almost at opposite ends of the spectrum (film is all external description and short clipped sentences; whereas prose allows internal reflection and metaphor, so it can be very hard to switch back and forth between the two). But there are not many horror writers that get to write both fiction and film, and even less in this country, so I’m going to do my damnedest to continue writing in all mediums. BS: Do you have any plans to deliver any more of your punchy short stories any time soon? Would you consider publishing a collection at some stage? AS: I’ve always intended to get enough stories together for a collection, but it’s been hard to put aside the time to do so. I have a couple ready to go out, but also another twelve or fifteen sitting in the wings awaiting writing. I think maybe I need to give up sleeping so I can get everything done in my life. That being said, I am being forced to write a short story by the end of the year—for your Cthulhu: Deep Down-Under collection—so I guess that’s the best way of getting these stories done: have someone make me do them. BS: So, what is next, film-wise and fiction-wise, for you Aaron? AS: I’m hopeful that by the time this interview’s published I’ll have another (very dark) film into production. That will make it quite an extraordinary year. I’m partway through a new novel that was pushed aside for the Creek one, so I’m looking forward to getting back to that. And I have a number of other screenplays I’m working on that I’ll start going out with next year once Creek’s released. On top of that I’d like to write two more books in the Blood series, and there’s another two or three novel ideas I have swirling. That should keep me going for the next ten or so years. Thanks to Bryce and Steve. « ‘Wolf Creek 2′ World Premiere – Venice Baby!